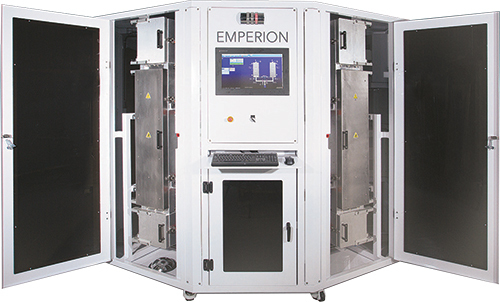 Duralar Technologies, Tucson, AZ, developer of ultra-hard coatings and coating machines, has introduced the Emperion system for high-throughput deposition on interior and exterior metal surfaces and complex 3D parts. The equipment debuted at the Surtech 2018 advanced-surface-technology conference, Feb. 14-16 in Tokyo, Japan. Casserly says that the Emperion employs plasma-enhanced chemical-vapor-deposition (PECVD) technology using Duralar's DualArmor hollow-cathode process. This creates a high-energy electron field that bathes metal parts in dense plasma, eliminating the unevenness that occurs with line-of-sight, spray-type coatings. The high-intensity plasma also coats parts more rapidly, at rates to 0.5 µm/min., which can take hours off of previous coating process times. Complementing processing speed, an operational design further streamlines the system's throughput. Streamlining the system’s throughput are twin processing chambers that optimize operator efficiency; lightweight, modular, custom-designed fixtures that enable fast, easy transfer of parts into and out of the chambers; and special quick-change chamber shields that reduce the need for chamber-cleaning downtime. Next-generation software with an intuitive operator interface controls the entire system. The Emperion’s compact design, 87 by 110 in., requires less electrical power than other systems, and it needs only a small amount of chilled water and process gas, making it easy to facilitize and install. Intelligent system design enables greater throughput with fewer operators. Two standard deposition chambers are vertically oriented, each 40 by 10 in. in diameter. Custom configurations are available. The Emperion applies different PECVD coatings, including Duralar's ArmorLube, which combines hardness to 2000 HV with dry lubrication. This coating's carbon content provides a natural graphitic lubricity and an low coefficient of friction to 0.1, making it well-suited for industrial machines that require clean, dry, permanent lubrication without oils or greases.